125,000 points Earn 125,000 Hilton Honors Bonus Points with the Hilton Honors American Express Business Card after you spend $3,000 in eligible purchases in the first 3 months of Card Membership. 3X 3X Everywhere Else. Terms & Limitations Apply. 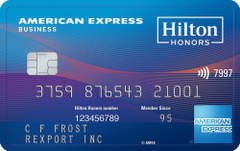 Our take: The American Express Hilton Honors Business card makes its grand debut with a large sign-up bonus that can amount to a lot of free hotel nights if you spend it strategically.